Body, panelling are made of Stainless Steel. 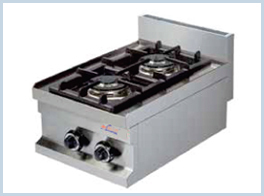 Burners are provided with safety valve and thermocouple.. If the flame goes out, gas is cut off. Gas devices are preset to liquid gas (G30). Natural gas nozzles are enclosed.